Living in an a retirement home in Antalya's Muratpaşa district, senior residents over 50 are working hard for the upcoming World DanceSport Federation (WDSF) Senior II Standard Dance Championship that will run from Oct. 14 to Oct. 16 in the city. 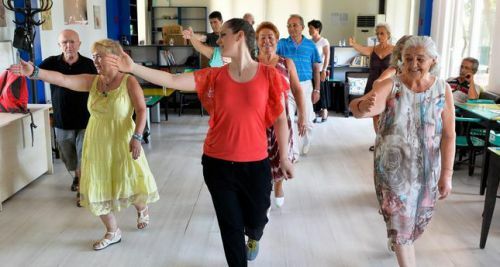 Six couples are training to compete in tango, waltz, foxtrot and quick step three days a week at the Fener Retirement Home for the competition in which Antalya will be represented for the first time in the age group of 50 and above. Dance trainer Şima Elif Umdu said that dance courses at the nursing houses began last year and some couples decided to participate in the international dance championship to take place at Gloria Sports Arena in Belek. They are showing great interest to the dance courses. Umdu said the championship features four different age groups starting from the age group of 35 to age group of 65 and above. "We will compete as a team in the age group of 50 and above. This will be a first for Antalya. To tell the truth, everybody wants to dance no matter how old they are," Umdu continued. Emel Özgür, 63, who is expected to win a position in top three, said she discovered her hidden talent thanks to the dance courses given at this nursing home. "The championship is a very special event for us. We are training three days a week. We have an energy and synergy. Apart from showing respect to the elderly, they managed to bring out the hidden talents in us," said Özgür. Stating that they have many friends who envy the opportunities provided to them by the Muratpaşa Municipality, Özgür concluded by saying, "We are happy to receive such services at our age. I am happy. I love retirement homes." Another resident, 71-year-old Ayhan Yağcıoğlu, had a stroke a decade ago. Yağcıoğlu, who had a difficulty talking for a while due to the stroke, is now one of the favorites in his age group. He thanked the Muratpaşa Municipality for the services they offer to the elderly. On the other hand, 59-year-old Mine Kırış is trained for the championship with utmost seriousness. Kırış, who does not skip any of the three weekly training sessions, said: "I love these kinds of organizations. This is the first time that I am participating in a dance competition. The friendship in the retirement homes is great, we love each other."